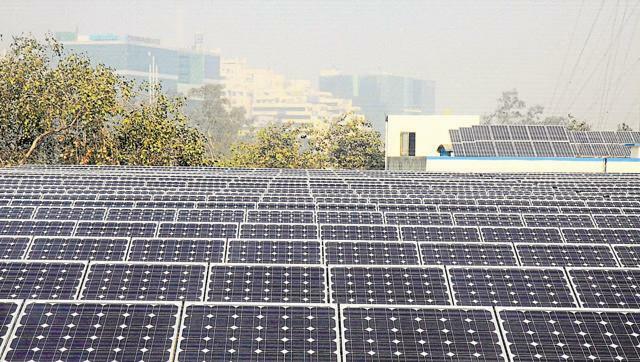 The MP government on Friday unveiled its new decentralised renewable energy policy 2016 titled ‘Smile on Every Roof’, hours after it was approved in the cabinet meeting in Bhopal. In this new policy the state government has introduced a net-metering system which will help those consumers who produce power through solar, wind or biogas lessen their electricity bills, said minister of state for renewable energy Harsh Singh and Madhya Pradesh Urja Vikas Nigam Ltd managing director Manu Srivastava in a joint press briefing at the secretariat. “The cost of the electricity generated through renewable means will be deducted from the electricity bills of the consumers — which means they will have to pay on the basis on net-metering”, said Srivastava. The Centre has proposed a capacity addition 40,000 MW among all the states by 2022. The state’s share of 2,200 MW is seventh highest among all the states. Madhya Pradesh is endowed with high solar radiation with around 300 clear, sunny days. In addition, the state offers good sites which have a potential of more than 5.5 kwh/sq metre. Srivastava said the policy has been brought to encourage development in decentralized renewable energy-based electricity projects, to reduce dependence on traditional resources of energy, to reduce carbon emission and to develop solutions for conventional energy for future. “People who will use renewable sources like solar panels on their roof tops and premises will be given a subsidy of 30%. Besides, people who produce more electricity through renewable means especially solar, can sell the same to others after paying due taxes”, he said, adding each household has to invest Rs 2.5 lakh for installing solar panels with a capacity to produce 3 KW. “This cost excludes cost of batteries”, he added. On non-conventional energy sources, he said subsidised LED bulbs were being given in the state at `85 each and so far 65 lakh such lamps have been made available to the people for use. Net metering is the process through which a solar power plant is installed on roof, open space, and walls of the building to generate electricity. Generated power is first used in the building for captive requirement and then surplus power is fed to the power grid of power distributing companies. The Centre has proposed a capacity addition 40,000 MW among all the states by 2022. The state’s share of 2,200 MW is seventh highest among all the states.